Here’s a tip: Opossums and possums are different animals. Opossums live in North America, while possums live in Australia and other countries. Both animals are marsupials, but possums are more closely related to kangaroos. But here’s where it gets confusing: in North America, people often shorten opossum to possum when talking about the creatures prowling around the backyard at night. One news source described an animal that you might see “wobbling across your yard at night” or “scurrying down the pavement with a batch of babies clutching onto its back.” What is the name of this beast? Without hesitation, you might exclaim “An opossum!” However, another person might call it a possum. 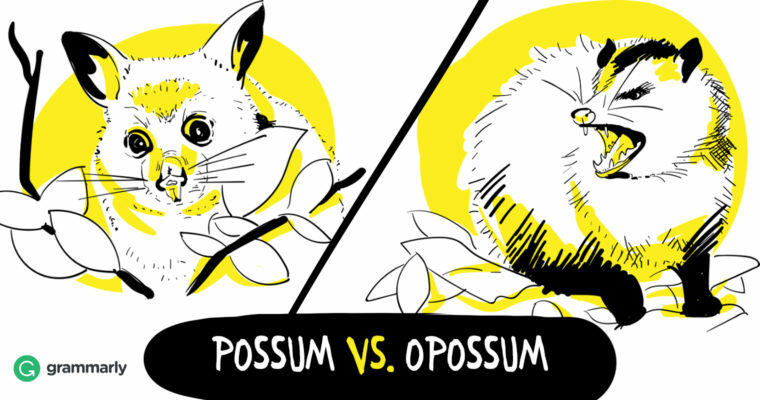 Is there a difference between an opossum and a possum? Yes, there is. They are entirely different animals. 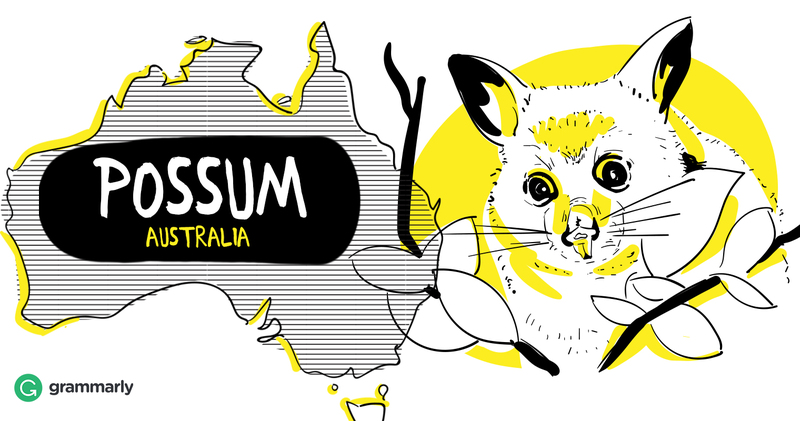 Possums, on the other hand, live in Australia, New Guinea, Sulawesi, New Zealand, and China. Their name does derive from opossum. Sir Joseph Banks, a British botanist, thought they looked enough like the American opossum to give them a similar name. However, kangaroos and other Australian marsupials are closer relations than American opossums. Possums belong to the Diprotodontia order. Already your lungs have flown away like a bird and your guts have slithered away like a snake. Now your tongue drops dead like an opossum, while your jaw begins to gallop on the spot. Another author, Amy Rowland, makes reference to the grayish-white color of the opossum. (Possums are brown.) This quote is from The Transcriptionist. The room is the color of old opossum or new pumice, the color of newspaper without ink. In a book about her life with her late husband Steve Irwin, Terri Irwin talks about her view of opossums. I’ve always liked possums. Like a lot of wildlife, they are completely misunderstood. Virginia opossums are the only North American marsupials. Wait a minute, did you notice that she used possums and opossums in the same paragraph? Terri is an American, but she owns a zoo in Queensland, Australia. To which animal is she referring? From context, you can conclude that it’s “the only North American marsupial.” In fact, it is quite common for people to drop the O of opossum in speech and in print. Let’s look at some examples. You will see possum written in two ways. Tina Fey, author of Bossypants, uses the term possum. Once again, we can use context clues (torpor) to guess that it is the North American variety. On the other hand, Bill Watterson makes it clear that he is dropping the O of opossum by adding an apostrophe in its place. In another quote from Terri Irwin, context clues suggest that this time she is talking about the Australian possum species. “Blorft” is an adjective I just made up that means ”Completely overwhelmed but proceeding as if everything is fine and reacting to the stress with the torpor of a possum.” I have been blorft every day for the past seven years. Hey Susie Derkins, is that your face, or is a ‘possum stuck in your collar? “We had snakes and goannas mostly, but also orphaned roo joeys, sugar gliders, and possums,” Steve said about these humble beginnings. Garner’s Modern American Usage points out that possum, pronounced poss-uhm, is actually the more common of the two spellings for North Americans. A Google Ngram search reveals an alternating pattern. Opossum was on top as recently as the 1970s, but possum has the lead now. Opossum, pronounced uh-poss-uhm, is still favored for formal writing. Does this cause confusion? It depends on the audience and the writer or speaker. For instance, most would assume that an Australian saying “possum” is referring to the animal that lives in his native country. 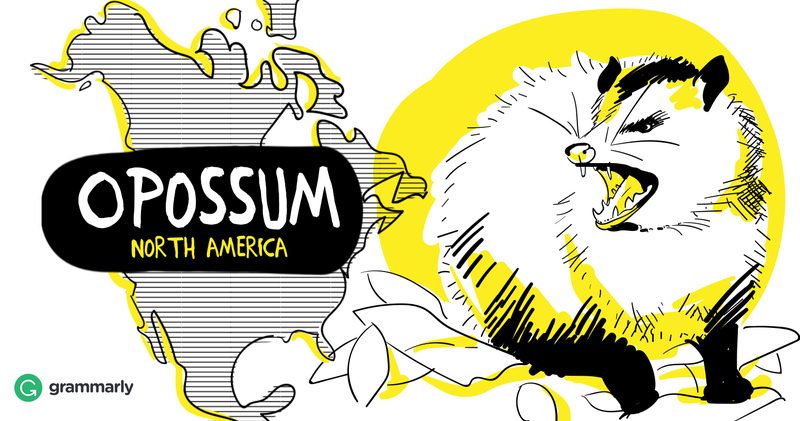 However, if an American says “possum” to an Australian, it might be unclear which animal is the subject of discussion. Remember that both possum and opossum only have one P. The most common error is to double that letter. To make the plural of opossum and possum, just add S to the end. Playing possum is an idiom that refers to the opossum’s characteristic way of responding to threats. When confronted, the animal involuntarily faints in shock for anywhere from several minutes to four hours. Its body goes limp, it drools, and it even emits an odor that imitates the smell of a decaying animal. In English, the phrase is used when someone pretends to be asleep, dead, or ignorant of a situation. He told me that humans cannot outrun a bear — they are great sprinters and climbing a tree is no good. Playing possum works OK, he said, if one is willing to endure a certain amount of roughing up. Le Clos had gone out strong in the heats and semifinal, but seemed to tire on both occasions. It turned out he was just playing possum. Coach Graham Hill said they wanted an outside lane for the final so he could try to shoot away unnoticed. “It nearly worked,” he added. The final example is from a book called With No Steps to Follow by David Allen Barton. For a split second, he thought about the wisdom of playing possum, but he decided if it were Powderface’s son, he would soon be playing possum with arrows in his back. Australian author Mem Fox features the possum in a picture book called Possum Magic. In order to protect a fellow possum named Hush, Grandma Poss uses magic to make her invisible. After some time, Hush grows tired of not being able to see herself. The two possums have to travel across Australia to find a magic food that will reverse her invisibility. The journey is full of adventures for the two lovable creatures. Gary Bogue, the former curator of the Lindsay Wildlife Museum in Walnut Creek, California, wrote a book called There’s an Opossum in My Backyard. This children’s story is about a baby opossum that falls from her mother’s back into the backyard of the Green family, breaking her tail in the process. She has quite a few memorable escapades as she steals food from the dog’s bowl, almost gets captured by an owl, and makes friends with other animals and the Green family. Possums appear in poetry too. In “Possum Come A-Knocking” Nancy Van Laan uses rhymes to tell the story of a grandmother who was sitting in her rocking chair knitting when an opossum knocks at the front door. A small child tries to tell her family that it’s a possum sporting a top hat and vest who is knocking, but they don’t see anything when they open the door. No one believes the poor child because the possum hides behind a tree when the adults come to answer the knock. It seems the possum was playing possum! What does that expression mean? In the article mentioned at the beginning, the final clue to the identity of the mysterious backyard visitor was this: “if you so much as say a word to one of them, they freeze in their tracks, bear their teeth, and start hissing and groveling with mouths dripping in spit.” Yes, it’s the opossum. However, Americans might call it a possum, much to the confusion of their friends from the Southern Hemisphere who envision a rather cuddly creature when they hear that word. If you are writing formally or you are not sure whether your audience will understand which animal you mean, make sure you spell opossum with an O unless you are talking about the marsupial from down under. However, if you are talking to a fellow American, he will likely know exactly what a possum is. He might even think it’s “good eatin’.” And if he is not familiar with the other species, it might be fun to explain the possum-opossum difference.